Welcome to St Bartholomew's Anglican Church on St Barts. We are an active and alive church with a mixed congregation of all ages, nationalities, cultures and backgrounds. 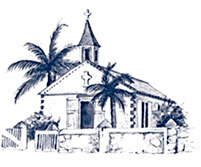 The Church's mission on the island is to reach out to the whole community - residents and visitors alike, whether English or French speaking. Hence our members and friends represent a wide variety of religious traditions. We greatly value this diversity and are a truly inclusive Church Community welcoming, valuing and respecting our differences, whatever those differences may be. In our worship and the life of the Church, we like to demonstrate the embrace of God, the compassion of Jesus and the mysticism of the Holy Spirit. We offer a variety of Services and Groups during the week (mostly in English, but some are bilingual) - details of which can be found in the Calendar below and within these web pages. Whether you are new to the Island, or just visiting, do join us ... we will make you feel welcome.